Trudy Forsyth is the managing director of Wind Advisors Team, a virtual consulting company that specializes in distributed and small wind standards, technology, global markets and policies. Trudy has worked in the wind technology field since 1994 and was the program leader of the National Renewable Energy Laboratory’s (NREL’s) distributed wind turbine program, including small and medium wind turbines. Since 1995 she coordinated efforts between the NREL/National Wind Technology Center technical staff and U.S. manufacturers for designing and testing new small wind turbines, accredited testing of commercial small wind turbines, and publishing turbine field performance and test reports. She developed near-term and mid-term industry strategies on behalf of the U.S. Department of Energy, the small wind industry, and a wide variety of stakeholders, including developing international and national turbine certification and labeling strategies. Trudy co-led the development of the second and third revisions of the International Electrotechnical Commission (IEC) Small Wind Turbine Design standard (61400-2) and the International Energy Agency Recommended Practice on Consumer Labeling of Small Wind Turbines. She has authored and co-authored technical conference papers on small wind turbines on topics including design features, economics, and commonalities in the U.S. marketplace between photovoltaics and small wind. 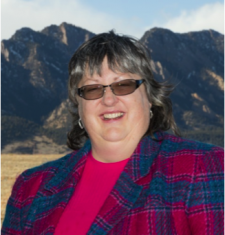 Trudy currently serves as board president for the Small Wind Certification Council and is a board member of the Distributed Wind Energy Association. Some of her unique outreach activities include her inclusion in a national Girl Scouts Cadettes journey handbook, her hosting of a NASA SCI Files wind energy segment, and her North American Farm Broadcasters interviews for rural radio. Trudy has received recognition for her leadership in distributed wind and her community contributions, including the NREL Outstanding Community/Professional Staff Award (2003), an International Renewable Energy Council Special Recognition Award (2005) and a Green Energy Economy Top 10 Women in Wind and Solar (2010), as well as a 1906 award from the IEC, and was recognized as the American Solar Energy Society’s 2012 Woman in Solar Energy. She holds a B.S. and M.S. in mechanical engineering from the University of Colorado-Denver.